“Steam laundries are everywhere taking the white man’s washing out of the hand of the Celestials, and is rapidly forcing them out of the washing business. 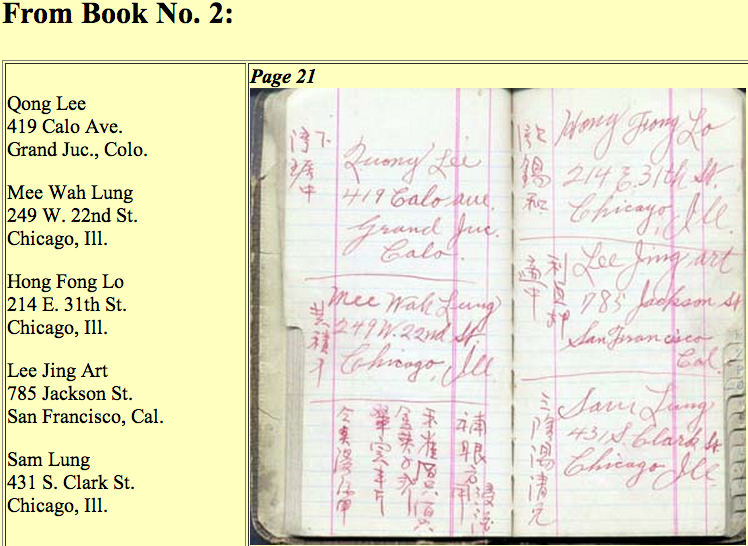 In 1850 there were about 276 laundrys in Chicago and of these but 66 or run by Chinamen… in the new directory, there are shown 459 laundries conducted by white people, most of which are steam, of a total of 707, but 249 are conducted by Chinese, … greatly less than that of half a decade ago. Steam machinery displayed at the world’s fair made a great impression on Chicagoans… “In no branch was this more marked than in the laundry machinery and after the fair steam laundries began to be started. Popular prejudice was against them for a time. They steam machines were said to tear the garments, to do rough work, to wear things out fast, and to rub the buttons off. They were even said to be used with chemicals, which injured the fibre, and the public was slow to patronize them. 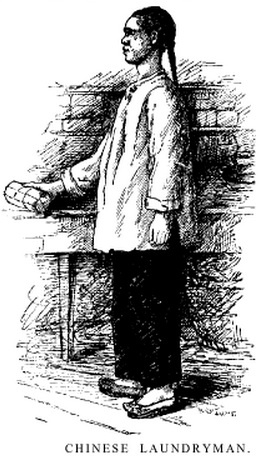 While it is true that many laundrymen turned to the restaurant business after 1900, and overall there was a decline in the number of Chinese laundries, many adapted and joined the modern age of steam machinery and abandoned the coal heated hand iron and Chinese laundries continued to exist for at least another 50 to 75 years. 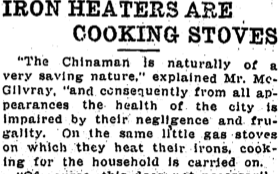 A Chicago newspaper, Daily Inter Ocean, published an article in 1876, “The Heathen Chinee as an Element of Chicago’s Population,” that depicted Chinese laundrymen in unflattering terms. These views were typical of how Chinese laundrymen were portrayed across the country then and they persisted for many decades. The method Chinese laundrymen used to moisten clothes for ironing was a frequent source of condemnation. 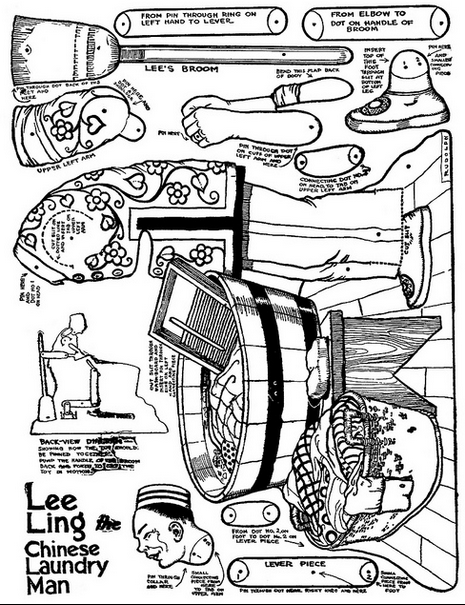 In 1922, the children’s section of the Los Angeles Times newspaper printed a cut-out toy of a “Chinese laundryman,” Lee Ling, that had moveable arms that could be attached to a broom and a wash tub lever. 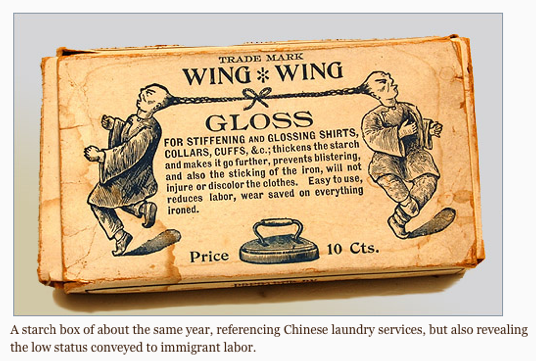 Many similar mocking representations of the Chinese laundryman were pervasive in popular culture through pop songs, advertising images, and movies. 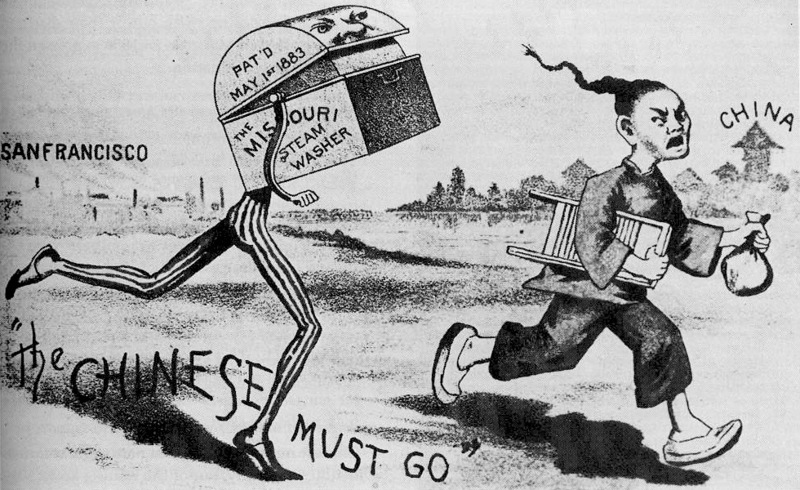 These negative stereotypes fostered long lasting public attitudes that were detrimental to Chinese throughout the U. S. and Canada. 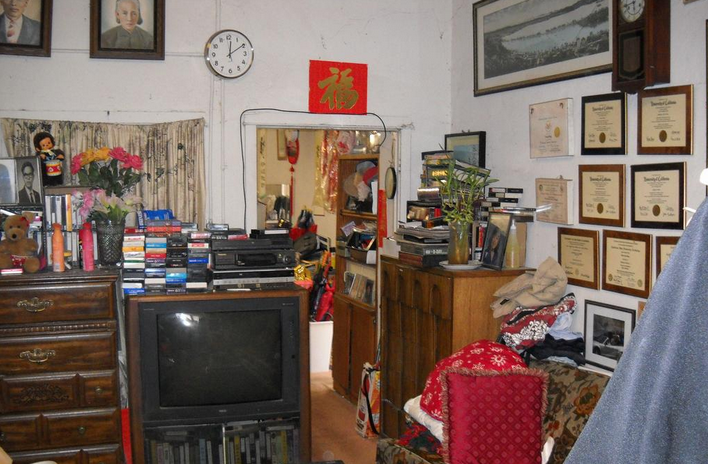 A White-owned “Chinese Laundry” in Kinston, NC. 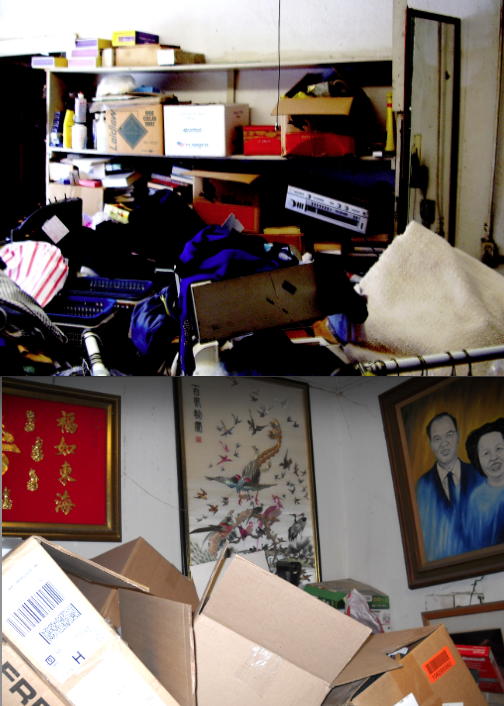 In Kinston, North Carolina, two white men, an electrician and a printer, both unemployed, opened a laundry on the premises of a Chinese laundry recently abandoned by Tim Sing, a Chinese from Hong Kong or Canton. The Greensboro Daily News headline on Jan. 6, 1932 on page 4, proclaimed “Chinese Laundry” Run By Whites. The article explained that the white owners planned to operate in the “Chinese style,” and make occasional presents of lily bulbs and tea to patrons. However, no mention was made about whether they would use Chinese style laundry tickets. One wonders, moreover, where they ever got this impression about how Chinese laundries typically operated. No mention was made about what experience the men had previously in doing laundry work. Hopefully, they knew how to heat those 8 and 1/2 pound irons and not scorch clothes as well as how to spray water to moisten them, Chinese style, of course. Unfortunately, there does not seem to be any record of how successful they were with their unusual business plan for a Chinese laundry. Prospects would have been dim indeed if many local residents followed the lead of Kinston firemen who in the previous spring installed a washing machine so they could do their own laundry (Greensboro Daily News, March 31, 1931, p. 2). Wonder if that fact could help explain why the previous laundryman, Tim Sing, abandoned his laundry equipment and his store? From their beginning, Chinese hand laundries had to rely on manual labor to wash and iron clothes, without the benefit of labor saving steam driven machinery. Irons were heavy, 8 and 1/2 pounds of iron, that had to be heated repeatedly over hot coals to a temperature that was not too hot to avoid scorching the clothes. 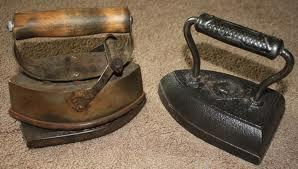 As the temperature soon dropped, the irons had to be reheated after a short period before they could be effectively used. As the day wore on, those irons felt heavier and heavier. Compared to the volume of work that could be accomplished with modern steam-driven pressing machines, the Chinese laundries were at a decided disadvantage. Yet, some customers still preferred the Chinese hand laundry because they felt that their clothes were more likely to be damaged by the machinery of the large white-owned laundries or they did not like the idea that their clothes would be co-mingled with those of other customers in large washing machinery. In any case, eventually Chinese laundries upgraded their equipment and acquired modern steam driven machines. 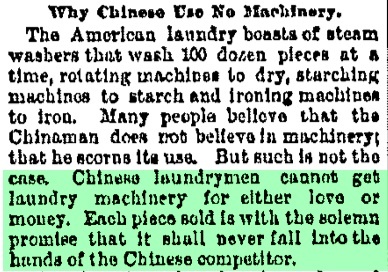 Apparently, manufacturers of steam laundry equipment were reluctant to sell to the Chinese laundrymen who they saw as taking business away from white-owned laundries. In the 1892 article below that appeared in papers around the country, it can be seen that an effort was made to prevent Chinese from acquiring steam driven equipment. 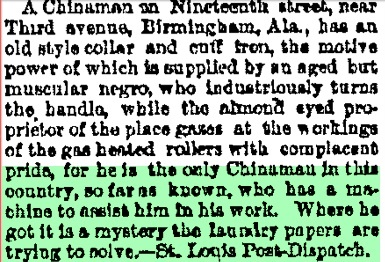 Despite the admonition that purchasers of steam machines must promise never to allow them to “fall into the hands of the Chinese competitor,” the article ended by admitting that at least one Chinese laundryman in Birmingham, Alabama, on 19th Street near Third had somehow managed to gain possession of a gas heated collar and cuff iron. 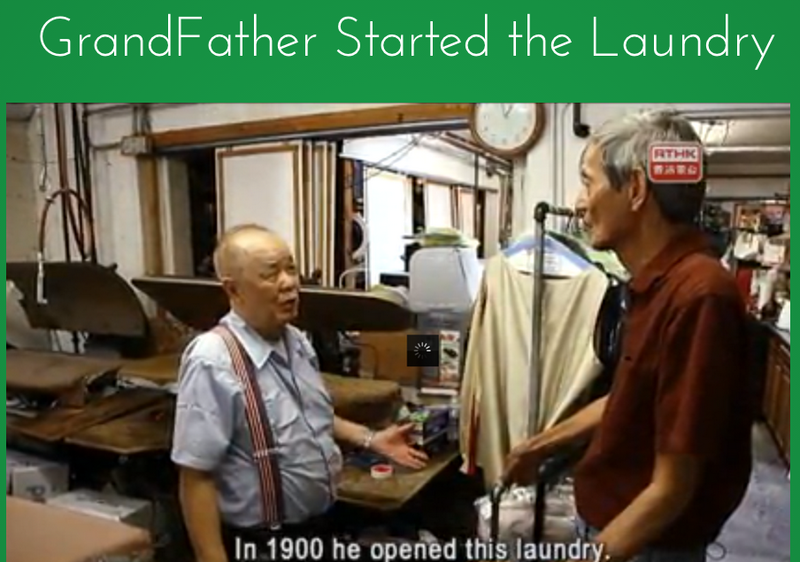 I was especially fascinated to learn about this pioneering Chinese laundryman because some of my distant relatives eventually came to run this Birmingham laundry a generation later around the 1930s. I wouldn’t be surprised to learn that this 1892 Chinese was also a distant relative! Chinese laundrymen did not employ the most hygienic procedures resulting in unsanitary conditions that prompted legal actions against them. 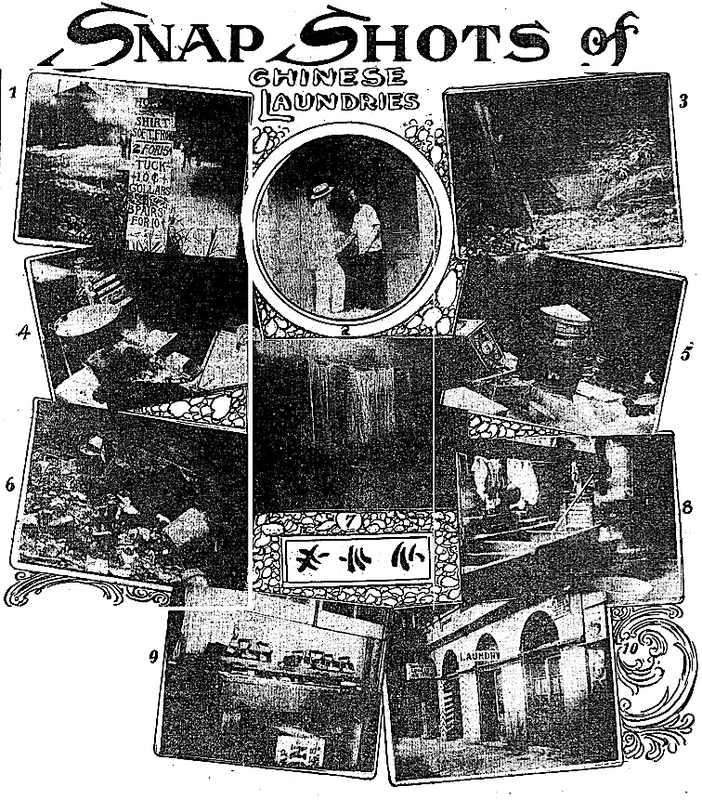 To cite one example, in 1913, New Orleans health officials launched a campaign to fine Chinese laundries that did not clean up their practices as reported in the Times-Picayune. 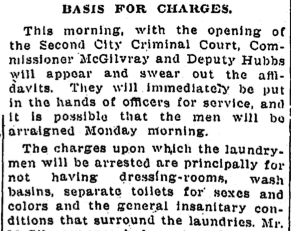 Several laundrymen were identified as violating sanitary laws in addition to not having separate dressing rooms and toilets for persons of different colors (black and white) and sexes. Plans were announced to arraign operators of 17 of the 24 inspected Chinese laundries. 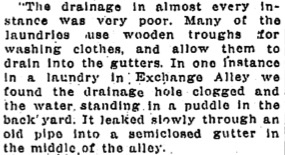 Early laundries did not have adequate plumbing to dispose of water, which would be left outside in the gutter, and served as breeding grounds for mosquitoes, especially in New Orleans. Chinese laundrymen typically lived on the premises of their laundry to save money and for physical safety. Consequently, they prepared and ate their meals as well as slept in areas close to the laundered clothes. 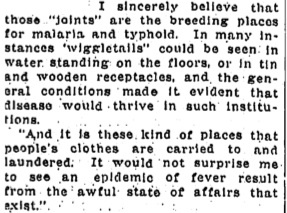 These risks were attributed to the “natural carelessness of the Celestial’ (a common term for Chinese at that time) and regarded as unsanitary threats to public health. Another health concern was that the laundry of ‘diseased and healthy’ customers was not washed separately. 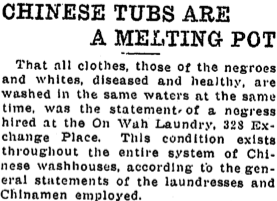 Chinese laundries were also criticized for failing to segregate laundry of whites and blacks, called “Colored” in that era, by washing them in the same tubs. While many of the actions taken against the Chinese were directed toward public health concerns such as the dangers of malaria spread by mosquitoes breeding in stagnant disposed water, it is apparent that other actions were prompted to maintain racial segregation. There was no known evidence that washing the clothes of different races was a threat to physical health. Assuming the wash water was sufficiently hot, strong soap was used, and hot irons were employed, it is also unlikely that threats to health existed from the mingling of clothes from healthy and diseased persons or cooking and eating near the laundering of clothes. An in-depth look at the difficult life of an individual Chinese laundryman can be more revealing than generalizations about Chinese laundrymen. 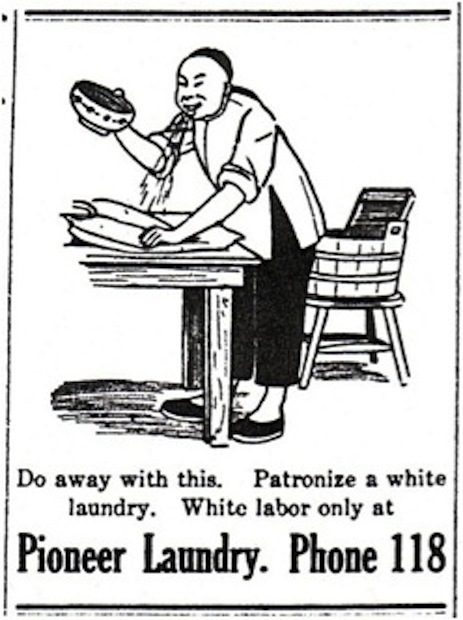 Even though the details will vary with individual laundrymen, there were many common challenges and obstacles that most of them shared from the immigration process, operating a laundry, being separated from family in many cases, and struggling to earn a living in the face of racial prejudices. The detailed look below at the life of Yee Jock Leong serves as a good example. A great grandson, David M. Lawrence, created a website, (accessed December 11, 2012), that provides a detailed chronology of his life and a description about many aspects of his difficult life. 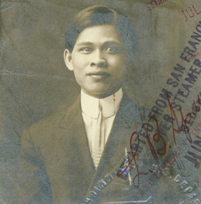 Copies of his immigration file documents and other photographs are included on the website. As a “bonus,” Lawrence, a journalist-writer-geographer-scholar of considerable talent, created a valuable webpage that provides a Chinese genealogical resource . Yee was born in San Francisco in 1884 but his father took him back to China when he was still a child. 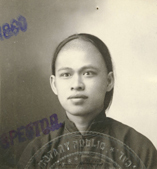 At age 19, he returned to the U.S. for two years but in 1905 he went back to China to marry. 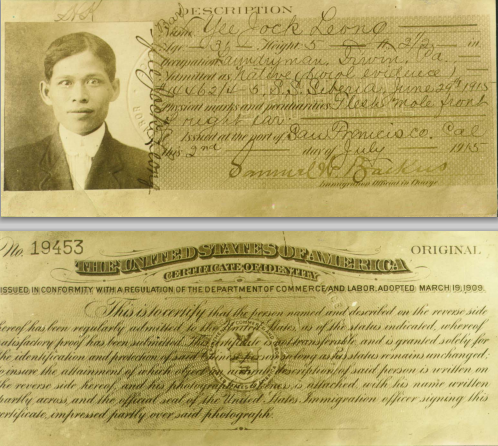 Yee then returned alone to the U. S. in 1908, leaving his wife and son behind. By 1914, he opened his own hand laundry in Irwin, PA., and in 1915 he married an American of Chinese and Mexican descent. They moved and opened a laundry in 1920 in Dayton, Ohio, but struggled financially during the Depression. He went to Chicago seeking work without much success for a few years while his wife stayed in Dayton to manage the laundry. He finally returned to Dayton to run the laundry until he died in 1936 at age 52 of tuberculosis. A remarkable legacy of Yee Jock Leong is the set of three address books containing over 100 names. Other Chinese immigrants may have also had such documents, but no one has collected or published them and many were probably discarded or lost. 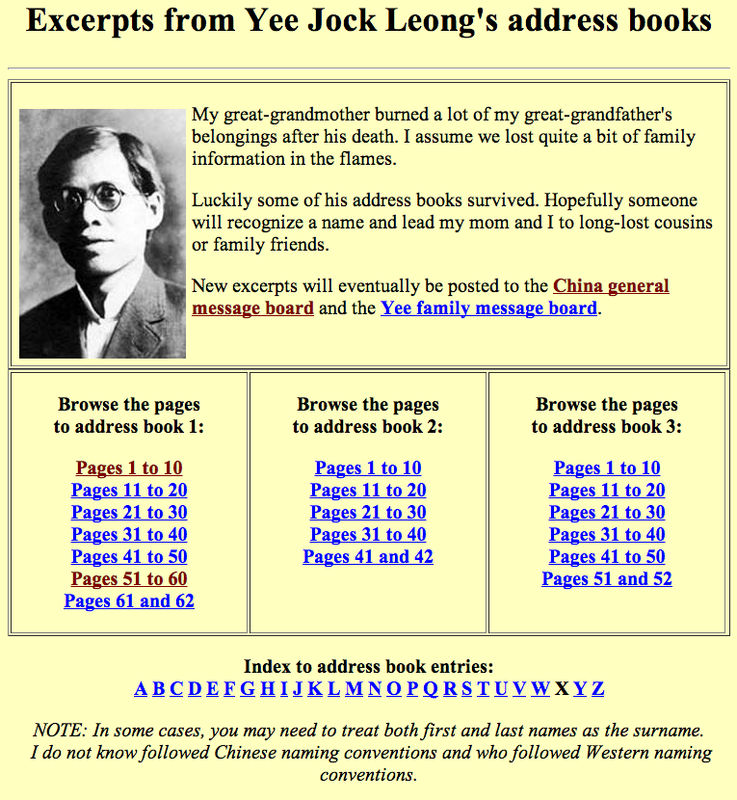 In the case of Yee Jock Leong, thanks to his great grandson, all of the entries were scanned individually and listed in a searchable database that includes an index to facilitate the examination of the names and addressed entered in English and accompanied sometimes with Chinese characters. The entries included many Chinese names of people who lived in or near Ohio, which is not surprising since that is where he spent many years. 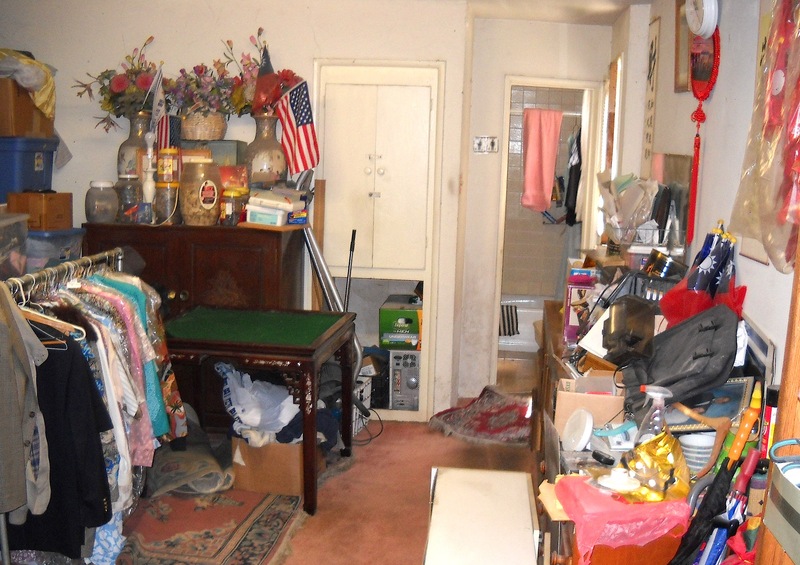 Some of the entries were business contacts including laundry supply houses, button sellers, plumbers, etc. Many of the entries were names of individual Chinese names representing Chinese in stores such as restaurants, laundries, merchandise, and groceries located all over the U. S. and Canada and a few in other countries. In addition, there were entries for Chinese associations such as On Leong in several cities. We do not know, and probably will never learn, what the relationship was between Yee Jock Leong and the many individual Chinese listed in his address books. How often did they correspond, and what did they say? How often did they meet in person? How many were relatives, friends, and casual acquaintances? Despite the lack of such information, the address books are rare evidence that shows that even though he was isolated from a Chinese community in Irwin, PA. and Dayton, Ohio, he managed to build a sizeable and widely dispersed network of Chinese contacts.